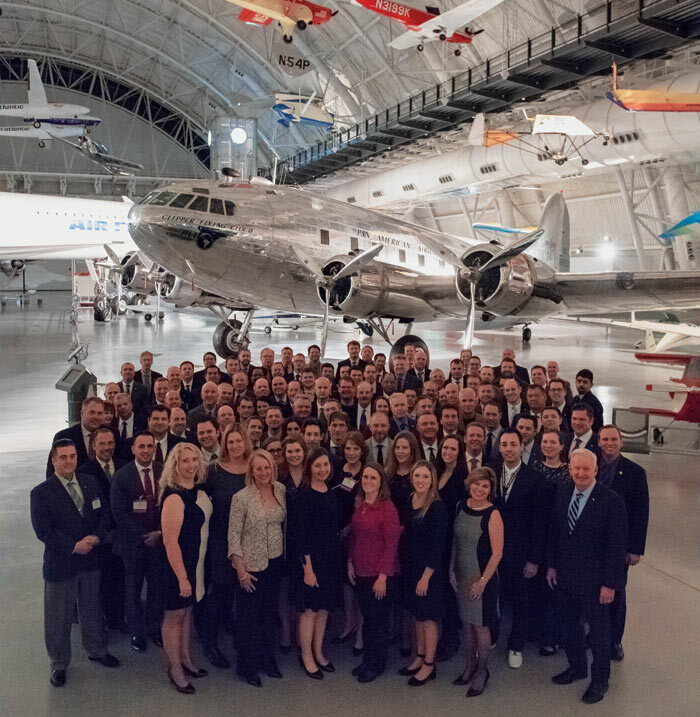 ALPA local council representatives and officers, along with ALPA’s national officers, pose in front of the Clipper Flying Cloud, a B-307 Stratoliner, at the Steven F. Udvar–Hazy Center. Who do you think is your most important contact at ALPA? You shouldn’t be surprised to hear that it’s your status representative, your local council officer. In addition to what’s happening locally, he or she can tell you about both your pilot group’s and the national organization’s activities. That’s because the person elected to represent your interests also serves as a member of your pilot group’s master executive council (MEC) and ALPA’s Board of Directors (BOD)—the Association’s highest governing body. Your status rep represents you at discipline hearings, helps you file grievances, and solicits your feedback for important pilot-group decisions. Making sure ALPA’s new local council officers are properly prepared to handle their many responsibilities when they begin their terms is essential to the success of our union, and that’s where the annual Leadership Training Conference comes in. This interactive seminar provides our pilot reps with the guidance and understanding they need to be effective ALPA leaders. This year, 82 local reps and officers from 24 of the Association’s 34 pilot groups joined us in February at the Association’s Herndon, Va., Conference Center for thought-provoking discussions, role-playing exercises, and other activities. The Leadership Committee recognizes that everyone brings something different to the table, and throughout the training we encouraged attendees to ask questions, fully immerse themselves in conference exercises, and interact with their fellow reps from other pilot groups. Capt. David Farmer (Delta) addresses a question from the audience during the conference. A brief look at this year’s agenda highlights what local council reps need to know and what they may be called on to do. Conference attendees learned how to run meetings and manage committees. They reviewed methods of effective group decision-making. They discussed what to do when their members face possible disciplinary action and looked at the current economic outlook for the airline industry. Staff members from ALPA’s Legal Department discussed the Association’s duty of fair representation, the union’s obligation to represent all pilots at every ALPA pilot group fairly, in good faith, and without discrimination. Our staff attorneys talked about what local council officers can be held responsible for and simple steps they can take to protect themselves. Dr. Quay Snyder, ALPA’s aeromedical advisor, reviewed the support ALPA’s Aeromedical Office provides members regarding medical certification. Attendees explored what they can and can’t do when hosting social media sites. They also learned about ALPA’s strategic plan, the flight plan that guides the union in every decision it makes. In fact, ALPA’s Leadership Training Conference advances the Association’s goal “to develop and deliver effective direct member services” by enhancing the expertise of our elected pilot leaders. During the conference, pilots participated in afternoon breakout sessions that included mock MEC meetings and hypothetical disciplinary investigations. These opportunities gave the reps a chance to apply what they learned and to try out some recommended practices. Throughout the week, the Leadership Committee scheduled segments that gave attendees the opportunity to meet ALPA’s senior leaders. A dinner featured a question-and-answer session with the Association’s four national officers, who also gave presentations during the conference. Capt. Bill Couette, ALPA’s vice president–administration/secretary, who oversees Leadership Committee activities, presented several training sessions, including one titled “You’ve Just Been Elected…Now What?” During this segment, he told attendees, “Being a good ALPA rep takes perseverance, teamwork, and an openness to learn,” adding that it’s important to routinely communicate with your members. He also gave a thorough explanation of the Association’s rule of governance, Robert’s Rules of Order, and the duties and responsibilities of BOD members. “Our biggest asset is our member-driven strategic goals,” remarked Capt. Tim Canoll, ALPA’s president, who reminded local council officers that members can access these at www.alpa.org/strategicplan. In a separate state-of-the-union presentation, Canoll provided an overview of recent collective bargaining, noting that to negotiate a good labor agreement, you need to have pilot unity, a positive pattern to bargain against, and the airline’s ability to pay. He also reviewed the Association’s top priorities. ALPA is the world’s largest nongovernmental aviation safety organization and Capt. Joe DePete, ALPA’s first vice president and national safety coordinator, outlined the activities of the Association’s Air Safety Organization, which encompasses aviation safety, security, jumpseat, and pilot assistance matters. Capt. Randy Helling, ALPA’s vice president–secretary/treasurer, outlined how the Association budgets income and charted the progress ALPA has made in stabilizing its finances since 9/11 and the economic downturn of 2008–2009. Capt. Dan Adamus (Jazz Aviation), an ALPA executive vice president and ALPA Canada president, also joined us to talk about issues facing Canadian pilots, such as the need for new flight-time/duty-time regulations based on the science of human fatigue. He also reviewed recent outsourcing issues, including the serious scope concerns raised by WestJet and Encore pilots. I’ve highlighted just some of the many topics we covered and how the conference grooms pilot leaders for the opportunities and challenges they will likely encounter. Local council officers began their three-year terms on March 1, and every year approximately one third of these positions are up for election. Every Leadership Training Conference I’ve been involved with during my 19 years with the committee has been different because the people we work with and the environment that we work in are always changing. It’s not unusual to see seasoned ALPA officers sitting next to pilot reps who are brand new to the union. Both have something to share, and I repeatedly encourage attendees to use this opportunity to network with their peers. A special thanks to my fellow Leadership Committee members who give so much of themselves to this event: Capt. Mark Moore (Delta), Capt. Rob Slovitsky (United), and F/O Mark Lockwood (Delta). Unfortunately, Capt. Andy Nelson (Spirit) couldn’t join us this year. I’d also like to thank the many staff members who work so hard to make the conference possible. Finally, I’d like to acknowledge you, my fellow ALPA members. If you ever decide to run for local council officer, the Leadership Committee stands ready to help you make the transition to your new role that much easier. Who knows—maybe we’ll see you next year! Trumka discussed the economy, politics, history, and the challenges of organized labor. He spoke about working with both current and past U.S. presidential administrations, pointing out that the AFL-CIO operates much like ALPA’s pilot-partisan approach when it comes to dealing with policymakers. It doesn’t matter whether an R or a D follows the name of an elected Member of Congress. “Those who support our issues get our support,” he said. Local council officers who participated in this year’s ALPA Leadership Training Conference brought their own special set of circumstances and expectations to this event. The following are brief profiles of five pilot reps who explain why they attended this year’s conference. F/O Julio Canales (Delta), his pilot group’s newly elected Local Executive Council (LEC) 48 vice chairman, said that this is his first ALPA leadership position. “I’ve always wanted to serve,” he noted, continuing, “I have a good friend who is actually the chairman for my council and I watched him go through his first term.” The A320 pilot soon decided he would be a good fit the vice chairman, remarking, “I threw my name in the hat, and here I am.” Canales attended this year’s Leadership Training Conference to learn more about ALPA’s resources and support in place to help him better perform his duties. The pilots of WestJet have been with ALPA for about a year, and Capt. David Colquhoun, who flies the B-737 out of Calgary, Alb., is the first elected chairman for his pilot group’s LEC 230. Colquhoun said his primary reason for attending this year’s conference is to establish new relationships with other ALPA pilots. “WestJet pilots were not unionized for their first 20 years, so we really were out in the cold,” he commented. “The resources we’ve been offered for our negotiations, taking place right now, and the support to create our committee structure have been fantastic.” Colquhoun emphasized that the WestJet pilots view ALPA membership as a chance to learn from others’ experiences.